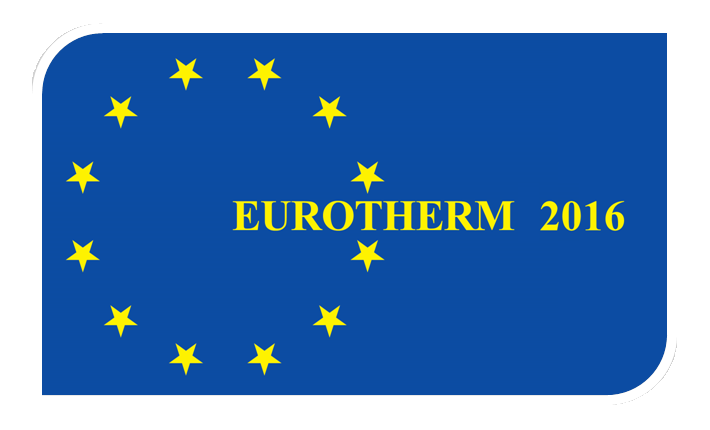 The aim of EUROTHERM 2016 conference is to provide a forum for the exposure and exchange of ideas, methods and results in heat transfer, fluid mechanics and thermodynamics. Papers on all aspects of these research areas, from fundamental and applied to novel experimental techniques and innovative applications are welcome. Including: adsorption and desorption, boiling and evaporation, combustion, computational/numerical methods, condensation, conduction, convection, electrochemical transport, jets, mass transfer and drying, measurement techniques, micro-/nano-scale heat transfer, molecular transport, MHD and plasma, optimal control/theory, phase change, porous media, radiation, solidification, thermal solar energy, turbulent transport, two-phase/multiphase flows. Aerospace Technology, Advanced Energy Systems, Advanced Environmental Systems, Biotechnology and Medical Engineering, Cryogenics, Education, Heat Exchangers, Interactive Computational and Experimental Methodologies, Inverse Problems, Manufacturing Processes, Material Processing, Micro-Electro-Mechanical Systems, Miniaturized Systems for Chemistry and Life Sciences, Miscellaneous, Nanotechnology.